Everton scraped a draw in injury time in a game they really needed to win if Champions League dreams are going to become reality. If ever there was a performance of contrasts this was it, awful in defence, yet brilliant in attack, Everton failed to do enough to warrant the three points. In truth this has been coming for a while, the defence have struggled throughout the season and in a game when Villa decided to go on the attack, Everton were found wanting. Phil Jagielka is Everton’s best centre back and needs to be playing in the centre of defence. Johnny Heitinga is an international class defender, yet is really struggling at the moment. Confidence is such a powerful commodity in football, and currently Johnny’s is shot. The crowd is on his back and last season’s player of the year is having a terrible time. And if consistency breeds clean sheets then the constant upheaval at right back, with Hibbert, Coleman and Neville all suffering injuries has created real instability in the Everton defence. On Saturday all three of the goals were avoidable. With Jagielka playing at right back, Everton have a soft centre and inside 3 minutes were behind. Heitinga offered no challenge to Benteke and the powerful Villa forward fired home. Villa’s second was scored by the scourge of Everton, Agbonlahor, who was unmarked to head Villa into a 2-1 lead. Villa scored their third shortly after half time. Moyes should really have taken Heitinga off at half time, the crowd were on his back and he looked dazed by what was going on around him. Villa took advantage of this uncertainty, with Benteke bravely heading home, with very little challenge from the Dutch defender. In years gone by, Everton would have folded and accepted defeat, but not his Everton. Anichebe had already scored a superb equaliser in the first half, powerfully turning a Villa defender before finishing into the bottom corner of the Gwladys Street net. With 20 minutes remaining, the Nigerian strongly held off the Villa defence and returned a one-two to Fellaini to fire into the Villa goal. 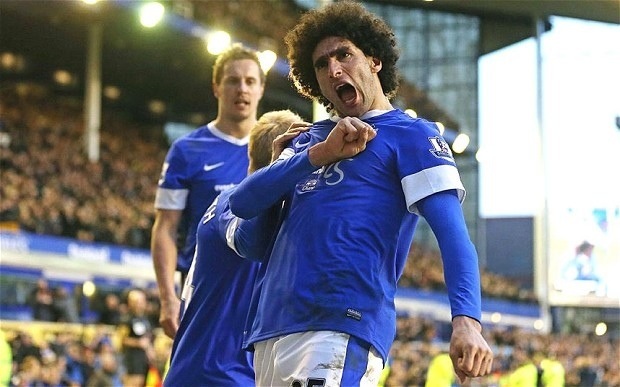 This woke the Goodison crowd and roared on by just over 38,000, Everton pushed forward in search of further goals. Even a goal behind, victory was not out of the question and when Fellaini headed home a Baines corner with three minutes of injury time remaining the Evertonians still believed. Alas, the winner was not forth coming, but Everton demonstrated how difficult they have become to defeat. Disappointment was rife as the supporters spilled out onto the streets around Goodison and continually dropping points at home against teams Everton would expect to win is going to cost the Blues dear. Sylvan Distin summed up things well tweeting, that “we will just have to go and win were no one expects” and next Sunday provides a perfect opportunity with a trip to top of the league Manchester United. Next Post Why do we boo our own?